Lauren Theis, right, director of education for Raritan Headwaters, looks at samples from the Black River with a camper from LifeCamp in Pottersville. The educational outdoor program was made possible by a grant received from The North Face’s 2017 Explore Fund. BEDMINSTER TWP. 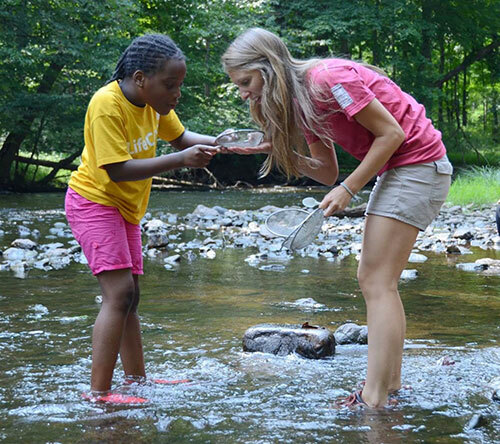 – Urban children attending the LifeCamp in Pottersville are getting hands-on lessons in river ecology this summer, thanks to a grant to the Raritan Headwaters Association from The North Face’s 2017 Explore Fund. Raritan Headwaters, a regional watershed watchdog organization, was awarded $8,000 to provide nature education to campers, using the Black River as an outdoor classroom. Campers between the ages of 6 and 13 come from the greater Newark public school system and the city’s charter schools. Twice a week throughout the LifeCamp’s six-week session, trained educators from Raritan Headwaters come to the day camp to provide a combination of classroom and hands-on instruction. Youngsters learn about benthic macroinvertebrates – small aquatic creatures whose presence in a river indicates clean water – and then wade into the river with nets to look for them. They also learn about sources of river pollution and how they can help protect water quality and the wildlife that lives in and around rivers. The LifeCamp, which has operated since 1923, is located along the banks of the Black River, also known as the Lamington River. The North Face selected a total of 43 nonprofits that create opportunities for people to develop a passion for the outdoors and desire to care for local parks and public lands. Selected programs use outdoor exploration as a catalyst for positive personal or societal change, to encourage healthy lifestyles and promote environmental stewardship. “A desire and willingness to explore and care for our outdoor playgrounds is part of our brand DNA,” said Ann Krcik, senior director of Outdoor Exploration at The North Face. “We are proud to support these outstanding programs that expose participants to benefits of the outdoors. As part of its mission to start a global movement of outdoor exploration, The North Face introduced Explore Fund in 2010 and the program has since provided more than $2.75 million in grants to organizations committed to inspiring people to explore the outdoors and care for the environment. The largest watershed organization in New Jersey, Raritan Headwaters has been working since 1959 to protect, preserve and improve water quality and other natural resources of the Raritan River headwaters region through efforts in science, education, advocacy, land preservation and stewardship. Raritan Headwaters Association’s 470-square-mile region provides clean drinking water to 400,000 residents of 38 municipalities in Somerset, Hunterdon and Morris counties and beyond to some 1.5 million homes and businesses in New Jersey’s densely populated urban areas.